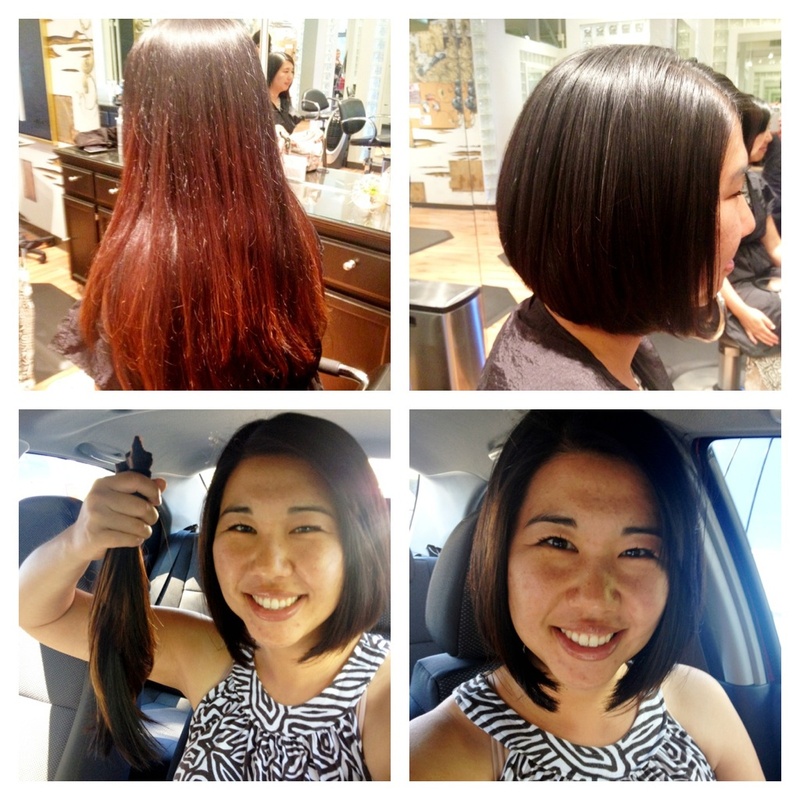 I chopped off my hair yesterday…literally chopped it off. You can see it in two sections in the picture. The stylist with her shears ready asked me, “Are you ready?” like she was about to proceed with some kind of painful procedure. I was ready. “Do it,” I said. She literally had to saw away at the hair in order to cut it off. It was not just a quick snip snap…a real saw would have probably been easier because even with her super cool shears, it took her at least a solid 2 minutes to cut those two sections of tied hair cut off of my head. In that moment, I remembered the story of Samson and Delilah, and wondered what was being released from me as the hair came off of my head. I’m used to changing my hair. 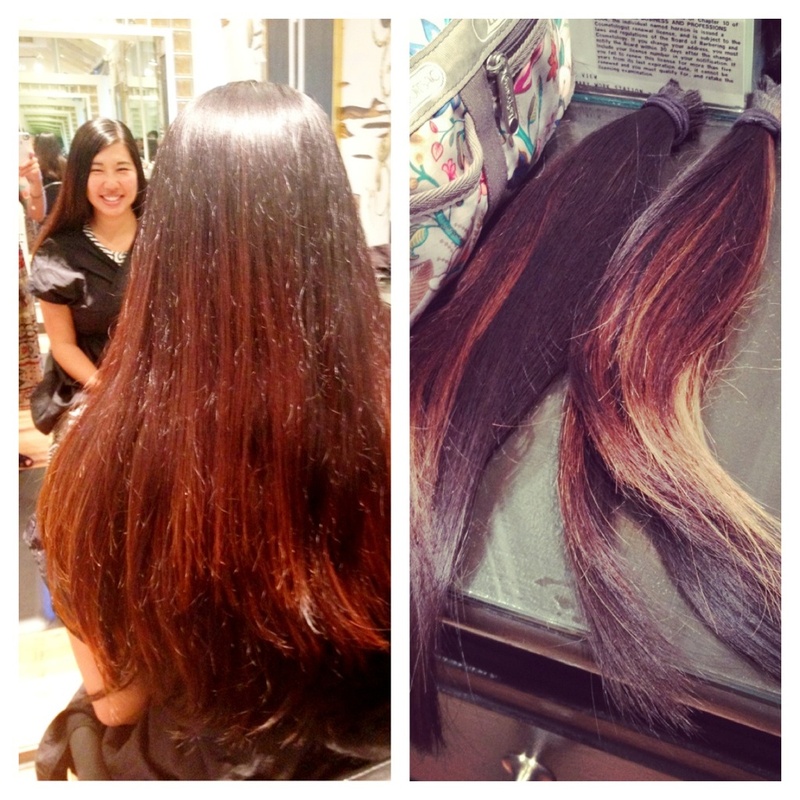 I have had it dyed or highlighted almost every color under the sun and I have had many different hair cuts and styles. I would change my hair with the changing of the seasons. However, I realized recently that besides the occasional trims here and there over the years, I have not really cut my hair short since I moved to California 4 years ago. I started growing it out and it’s been long every since I’ve become an ordained minister. In many ways, my long hair has become part of my identity as a pastor, which is why I kept it long for so long. There was just something that compelled me to keep it long, even when I wanted to cut it off–like I would lose something if I did cut it too much. I have no idea what I thought that might be… maybe my femininity, maybe some weird identity I had placed myself into with my long hair, which I had never done before. Well, as I mentioned in my first post, abiding in hope comes with a lot of sucky-ness…and it’s not just recently. There have been a lot of crap moments in the past 4 years along with moments of redemption. And you know how you just want to change something when major changes happen? That’s when I usually cut or color my hair. But ever since I became “dedicated to God” as a pastor, I wouldn’t cut my hair when those changes happened. It was almost like I believed that my long hair was the power that I had for…who knows what. I don’t know. It’s funny how you start tricking yourself to believe that some random feature or thing makes you who you are…even hair. Delilah prodded Samson day after day about the secret to his strength… so much that he was sick of it to death and finally told her his secret. I needed to cut my hair because I needed the false strength that I was gripping onto to leave me. I need to become as weak as any other human being does in times of trial, heartbreak, transition, and change. I needed desperately to let go of any kind of power or control I thought I had over my situation and my life over the past few months. So I decide to chop off my hair as a symbol of that. It might sound crazy and you might think I’m nuts for making this connection, but it feels so real for me. It was completely liberating and LITERALLY freeing and I automatically became lighter the second it came off. The kiddos I live with, 4-year-old N and 2-year-old H both said I looked really different. H kept looking at me like I was a new person in her eyes-and that solidified that I did what was right for me for right now. I am different now, even if it seems like it’s just hair. Letting go and becoming new and becoming weak was just what I needed. Samson’s hair starts to grow again after it has been shaved and his strength slowly returns (we’ll just skip the part where Samson gets his eyes gouged out). My hope is that new strength will also return back to me as my hair grows again and be stronger after this time of weakness. Powerful statement of hope and renewal in times of weakness and fear. You are an inspiration! Thanks for sharing your journey. The times I shave my head or cut my hair drastically, often there is so much under the surface that is reflected in the outer change. The outside world doesn’t know, but I do, and God does, and sometimes my family and close friends do. Whereas Samson feared “my strength would leave me,” I find that that without hair, or with less hair, “my strength finds me.” May it be so for you too, Irene, in this time of transition and change.